Ohio Attorney General Mike DeWine poses with Washington Court House High School seniors Christina Luebbe and Blaise Tayese. State Senator Bob Peterson welcomed Mike DeWine to his farm on Wednesday for a fundraiser. Mike DeWine and wife Fran on stage in the Peterson barn. On Wednesday, State Senator Bob Peterson held a campaign event for Ohio Attorney General and Republican gubernatorial candidate Mike DeWine. Members of the community, as well as supporters from across the state, gathered in the Peterson barn to hear DeWine speak and to enjoy some refreshments. 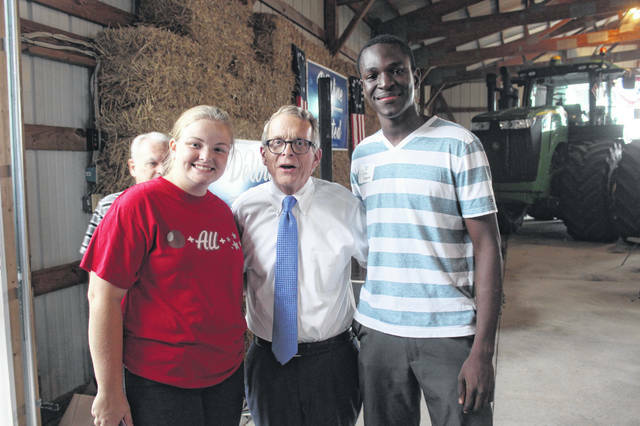 DeWine also focused on his agricultural roots, speaking of growing up working in his family’s seed business and of the farms he owns and the one he lives on. He remarked that “agriculture is something that surrounds us every day.” Representatives from a number of agricultural groups were present at the event to show their support for DeWine. DeWine is facing off against the Democratic gubernatorial candidate, Richard Cordray. One of the biggest challenges the state is facing, according to DeWine, is the drug problem. “It’s not unique to Ohio, but it’s bad here,” he said. He then asked the crowd to imagine if a terrorist attack had occurred in Ohio that day and killed 14 people. Then, he asked them to imagine if that kept happening, day after day. “We’d be up in arms,” he said. DeWine then noted that drug overdoses are killing about 14 people in the state of Ohio every day. He pledged that, if he becomes governor, “there will be a sense of urgency” regarding the opioid crisis. DeWine said, if he becomes governor, he will focus on stopping the Mexican cartel from bringing drugs into the state. He said he has implemented this approach as Attorney General in and around Dayton and Columbus, and has seen some success. He will expand the model to the entire state if he becomes governor. DeWine also hopes to expand drug abuse treatment. He said funding for this could come from the lawsuit he has filed against a number of large pharmaceutical companies for their role in the opioid epidemic. He also said he will keep Medicaid expansion, but add a work requirement to it for able-bodied adults. He said this work requirement could be fulfilled by attending substance abuse treatment or job training. Another of DeWine’s focuses was on the children of Ohio. He said, “I will dramatically increase the amount of money going to local children’s services.” He also said he would be supportive of providing some resources and funding to grandparents who are raising their grandchildren. During his speech, DeWine remarked, “This is gonna be a close race.” Poll data supports this statement with some polls showing DeWine in the lead and others showing Cordray, but all showing a slim margin between the two candidates. Voters will go to the polls in less than 70 days and early voting will begin in about 40.
https://www.recordherald.com/wp-content/uploads/sites/27/2018/08/web1_dewine-blaise.jpgOhio Attorney General Mike DeWine poses with Washington Court House High School seniors Christina Luebbe and Blaise Tayese. 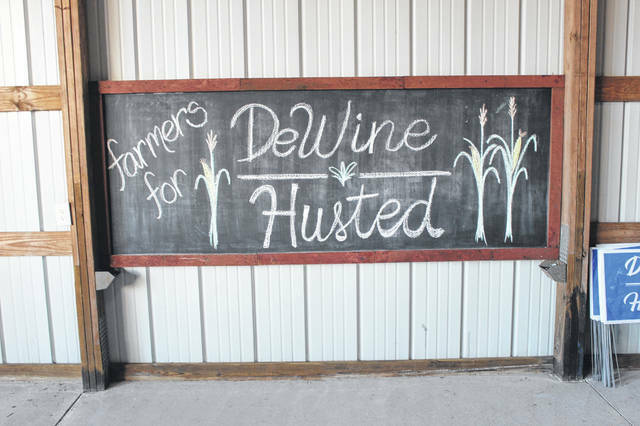 https://www.recordherald.com/wp-content/uploads/sites/27/2018/08/web1_dewine-farmers-sign.jpgState Senator Bob Peterson welcomed Mike DeWine to his farm on Wednesday for a fundraiser. 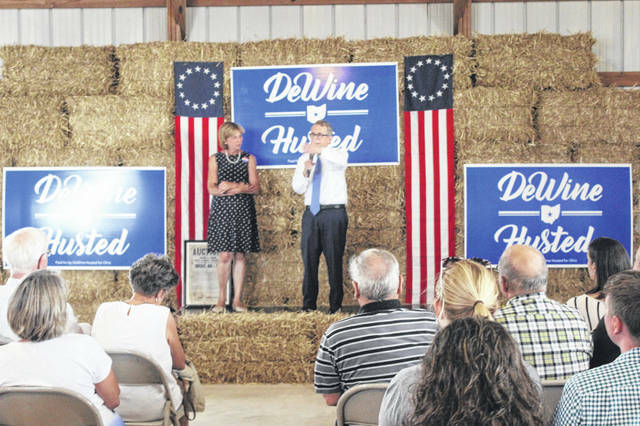 https://www.recordherald.com/wp-content/uploads/sites/27/2018/08/web1_dewinewife2.jpgMike DeWine and wife Fran on stage in the Peterson barn.